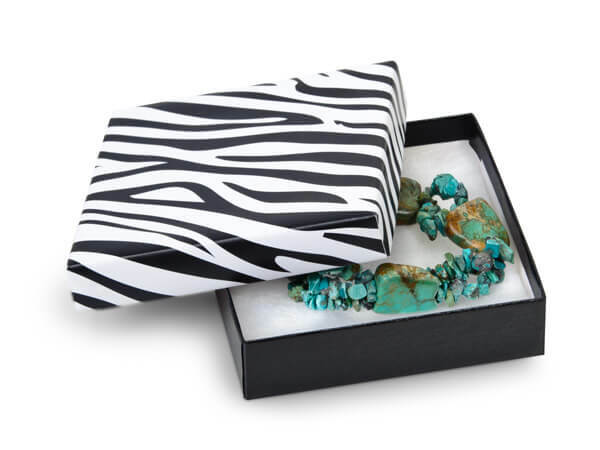 3-1/2x3-1/2x7/8" Zebra Print Jewelry Boxes feature a two-piece rigid box with black bottom and zebra print lid. Inside is white with non-tarnishing synthetic cotton fill. This square box is perfect for necklaces, bracelets and larger pins. Yes! We can print it! Personalize your boxes with a company name and/or logo. Call our Custom Print Department at (800) 547-9727 ext. 4 for details. These elegant jewelry boxes are available in our most popular sizes. They can be used for jewelry or small gifts. All boxes are filled with non-tarnishing ultra white synthetic cotton. Two-piece rigid set-up boxes packed in cases of 100. Assortments are also available. Made in the USA. Jewelry boxes contain 100% recycled boxboard which is the largest component of the box by weight; 80% recycled paper content including coverings.